Scrappy Cat is a single block scrap quilt. 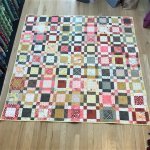 Make as many blocks as you like to make any size quilt. Stars, Decorations, Music, Snow and Santa! Trees, Poinsettias and Lilies! Stockings, Presents and Ribbons! Cookies, Pies and Cakes! Peace, Love and Joy! Celebrate the Season! This class is $25 per month.